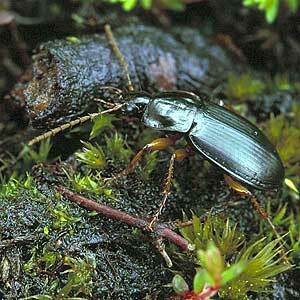 Description: A 6.6-8.5mm long brownish black or black ground beetle with pale appendages living among litter in acid woods and upland heaths mainly in the north and west. World Distribution: A Eurosiberian Wide-Boreal species (34), widely distributed across Europe, except the south and south-west, to the Caucasus and east to Trans-Baikal in Siberia. Irish Status: Widespread on mountains in northern counties but records are extremely sparse elsewhere. Ecology: Primarily a woodland species in Europe but in Ireland occupies upland Calluna heath or bog.